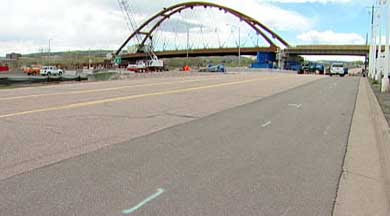 The 6th Avenue Bridge Rollout has finished early. Originally scheduled for 30 hours, work was completed in 14 hours, less than half the time expected. As a result, traffic resumed it's normal flow today instead of tomorrow. Denver's 9News.com has photos of the rollout as well as video coverage. Why is a rollout such a big deal? Consideriing the alternative, the strategy is very appealing. Denver's 6th Avenue, also US Highway 6, is a six-lane east-west artery that connects central Denver with I-70, Golden, and the western suburbs. On weekdays, it is a critical element for commuters in both directions. Speed restrictions and lane closures necessary to building a bridge in place during these times would slow the daily commute to a crawl, impacting hundreds of businesses and lowering Denver's quality of life. Rolling out a bridge and doing a weekend closure is much less disruptive. Negative publicity and grumbling drivers are not what the FasTracks project needs. So why is this bridge so important? Because the West Corridor parallels the 6th Avenue route for the entire route, the bridge is the most visible reminder to commuters of their coming alternative transportation option every day. It is a 286 foot-long and 65 foot-tall billboard advertising for FasTracks and light rail across Denver. It only improves when they actually begin running light rail cars over the span.